The race for this year’s FIFA Ballon d’Or is likely once again to come down to one of two men so talked about that their names barely even need mentioning. What makes the 2013 award more interesting than in some of the previous editions, is that Lionel Messi’s four-year winning streak appears set to end. The Argentine will be on the podium once again when the winner is announced on 13th January in Zurich, but he will have to applaud as Franck Ribery or, more likely, Cristiano Ronaldo, take his crown from him. Ronaldo is the clear front-runner and a cursory glance at the statistics reveals exactly why. For one thing, he has scored 67 goals, three more than his two rivals combined, in 2013. This season he has struck an average of 1.5 goals per game and set a Champions League group stage record of scoring nine goals. He has also overtaken Pauleta and Eusebio as Portugal’s all-time top goalscorer. Ronaldo has produced arguably the individual performance of the season too, even if Zlatan Ibrahimovic and Luis Suarez may offer counter arguments. But certainly no one has displayed as high a level of quality when the stakes have been as high as Ronaldo did in the World Cup qualifying playoff against Sweden in November. It is worth recalling that performance. Having scored the only goal of the first leg, Portugal had a useful lead to defend in Sweden. Ronaldo put the Portuguese in front after latching onto a Joao Moutinho through ball to fire a convincing finish home. After Ibrahimovic had made his own claim to be the world’s best player of the moment, scoring a stylish quick-fire brace to put Sweden on the verge of the World Cup, Ronaldo took centre stage once again. He found himself through on goal from Hugo Almeida’s ball over the top, and his left-footed finish was that of a man determined that he was going to be in Brazil next summer as part of the show, rather than a spectator. And to ram home the point, Ronaldo raced onto another Moutinho through ball, rounded the goalkeeper and finished. It was a superb performance, although Ronaldo’s success is impossible to consider outside of the context of the drop in Messi’s standards. Due to a succession of injuries, Messi has been unable to build up the momentum of form that has carried him to the Ballon d’Or for the last four years. There is a justifiable sense that this year’s race is not of the same level as previous editions. Messi will often win the biggest games by creating chances out of literally nothing – witness that brilliant solo goal in the bad tempered El Clasico Champions League semi-final of 2011 as the most iconic example. By contrast, Ronaldo’s hat-trick against Sweden was technically inferior to Ibrahimovic’s treble against Anderlecht in the Champions League and any combination of three from Luis Suarez’s majestic four-goal haul against Norwich City in the Premier League. In all three situations, Ronaldo was finishing a chance that had been created by a team-mate. For the third, Moutinho’s through ball was more impressive than Ronaldo’s finish. And what of Ribery? The Frenchman has enjoyed a superb 2013 and unlike Ronaldo and Messi, he won the biggest prize on offer this year, the Champions League. However, whilst Ribery was superb for Bayern Munich, his skill and pace from wide areas crucial to their thrilling wins over Barcelona and Borussia Dortmund, he hardly stood out in the way Ronaldo and Messi have in years gone by. And there is a strong case to make that he wasn’t even Bayern Munich’s best player of 2013. For a start it is difficult to argue that he was even their best winger, such was Arjen Robben’s form. What of Mario Mandzukic too, whose pressing from the front was so crucial tactically to Bayern Munich’s historic success? Or Dante, whose arrival at the back hugely improved the side’s defence; or Javi Martinez, who many would justifiably consider Bayern Munich’s star performer of the season. Martinez has become the world’s best ‘defensive’ midfielder – superb positionally, adept at breaking up opposing attacks, yet then able to be really creative with the ball and drive his team forward; he was the heartbeat of the Bavarians’ treble success. Martinez would be a fitting Ballon d’Or winner this year. But the dilemma of judging Bayern Munich’s best player is quite instructive. This was the most successful team of 2013, yet there was no one obvious standout individual – and of course there wouldn’t be in a team sport. And so an individual award should really be going to the one player who has made the biggest impact on the sport during the calendar year. There is a strange obsession with awarding these titles to players who have played for the team who have won the biggest prize on offer that year – the correlation between the best individuals and the best teams is limited. 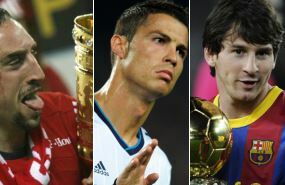 It is for these reasons that Suarez, Mario Gotze and Ibrahimovic may wonder why they aren’t in the running for this prize. And has anyone really made a more memorable impact this year than Ibrahimovic? From thunderous strikes from distance to his sumptuous back-heeled volley against Bastia, Ibrahimovic has shone in a year when the bar has dropped a touch. To make the impact he has from Ligue 1, with all due respect to French football, reveals the sensational year the Swede has had. Just as he had his place at the World Cup stolen from him right in front of his eyes in Stockholm by Ronaldo last month, it seems Ibrahimovic saw his hopes of landing the Ballon d’Or snatched away with it, in a particularly harsh double blow.